Journalists were barred from covering the wedding activities of Vice President Yemi Osinbajo's daughter, Damilola. Was Vice President Yemi Osinbajo hiding something from the public during the wedding of his daughter? This was the question on the lips of journalists covering his office. The journalists were barred from covering the wedding service of Osinbajo's daughter, Damilola to Oluseun Bakare, held at the National Christian Centre, Abuja on Saturday. They were equally not allowed to cover the reception which later took place at the State House Conference Centre inside the Aso Rock Presidential Villa. The same thing had happened Thursday during the traditional engagement of the vice president's daughter. The Vice President's media team had earlier announced that journalists would not be allowed to "record or film the event." It said "cameras are however welcome to record the arrival and departure formalities at the church." The media office promised to "share information and images-still and video -about the events later in the day." Guests were not allowed to go in with their phones as they were asked to keep them in their cars. Expressing apologies to State House reporters, the media office said: "Media cameras will not be required and therefore not welcomed in today's (Saturday's) events both in church and the reception. Please accept our request and need for an entirely PRIVATE event". 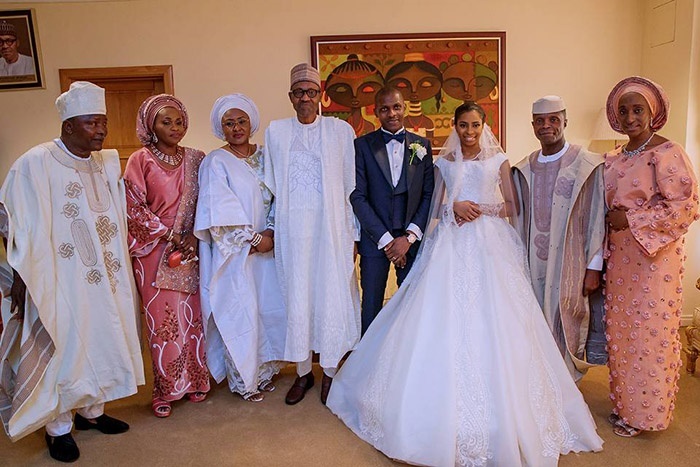 President Muhammadu Buhari and his wife, Aisha, were among the dignitaries in attendance. The event was also graced by the governors of Ogun, Osun, Oyo, Ondo, Nasarawa, Imo, Borno and Akwa Ibom States as well as members of the Federal Executive Council and the National Assembly, among others.